The patented forked light-barrier FA-.., bi is used in gas and water analysis for flow-monitoring in flowmeters with measuring tubes made of transparent material, e.g. Duran glass. Thanks to optical scanning, very low flow quantities can be detected even in flowmeters with non-metallic or very small (1 mm) floating balls. 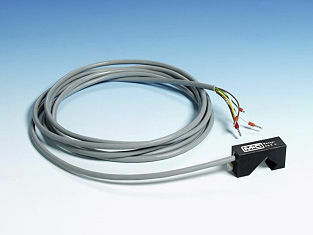 Optical flow sensor type FA2 bi. Photo-electric bistable clamp-on for flowmeter tube sites: 13-27mm,. With 3m connecting cable.